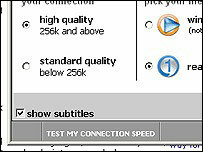 The BBC is adding subtitles to the internet edition of its technology programme, Click Online. This will make the show more accessible to viewers with hearing impairments who have missed the broadcast on News 24 and BBC World. The subtitling will be for a trial period of five weeks during which time viewers are being asked for feedback. The trial will involve new technology which accesses the subtitling files made for the original broadcast. The BBC says that - depending on the results of the trial - subtitles could be added to much of the streamed video available via its website. Making television programmes more accessible to audiences with sight and hearing impairments is now a legal obligation, but making content available via the internet is not included in the current regulations. "If broadband is to be accepted as a medium for distributing TV, it needs to include as many of the accessibility features that have become accepted over the air, cable or satellite," said BBC accessibility editor, Jonathan Hassell. Mr Hassell says captioned video is also useful for anyone who wants to watch it in a noise-sensitive environment such as an office. Research has shown that subtitles are also helpful for people whose first language is not English. But there are various technical hurdles to overcome before subtitling can be added to all of the BBC's online video streams. For example, the way subtitles are produced for live and pre-recorded programmes is different. "Work is happening in both of these areas, but the potential solution that is furthest developed is for the subtitling of pre-recorded video," said Mr Hassell. The move has been welcomed by the Royal National Institute for Deaf people (RNID). "RNID has long campaigned for television to be fully accessible for deaf and hard of hearing people," said head of parliamentary and legal affairs, Mark Morris. But he says that the regulations for subtitling must keep pace with new television platforms. "We are now concerned there are many forms of receiving television that fall outside the reach of the 2003 communications act, and we'll continue to lobby the industry to ensure that television - in whatever format - remains accessible to everyone." Another accessibility enhancement, audio description - a separate soundtrack describing the action on screen - is increasingly used by people with visual impairments to enhance their enjoyment of television programmes. Here too, the BBC is hoping that online video could be made more accessible. "The technical practicalities of enabling this for online video are being investigated at present," said Mr Hassell. "It's hoped that online video will be able to support audio description where this extra soundtrack is available for the original broadcast." 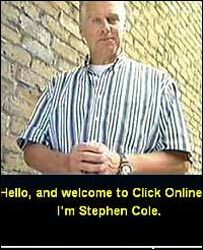 The Click Online subtitling trial will run until mid-December. The programme is broadcast every week on BBC News 24 and BBC World with shorter versions on BBC Breakfast at the weekend.